AppProjection allows you to create multi-projector setups. 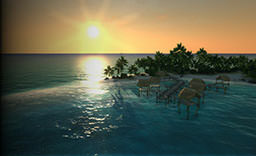 Edge blending, non-linear image mapping and color correction for each projection are supported. 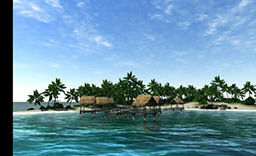 Therefore, AppProjection can project images onto large curved screen displays covering 360 degrees, if necessary. Moreover, each projection can be fully customized to use required view frustums. By default, up to 8 projections are supported to be output from one rendering node. 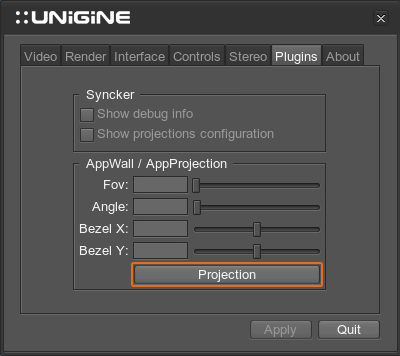 To set up projections, open the system menu by pressing Esc, go to Plugins tab and click Projection button. For the last three options, you should first choose a Projection to be adjusted at the top-right corner. Allows you to choose a projection in the drop-down list to set up its parameters: warping, edge blending and color correction. 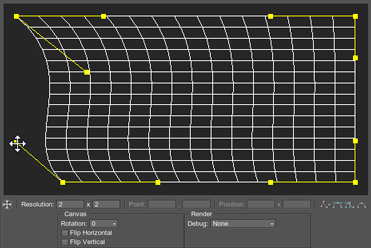 Warping is performed by defining a grid. A 2 x 2 grid is used by default. 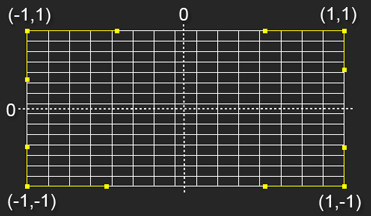 You can set the number of control points for the grid along horizontal and vertical axes. 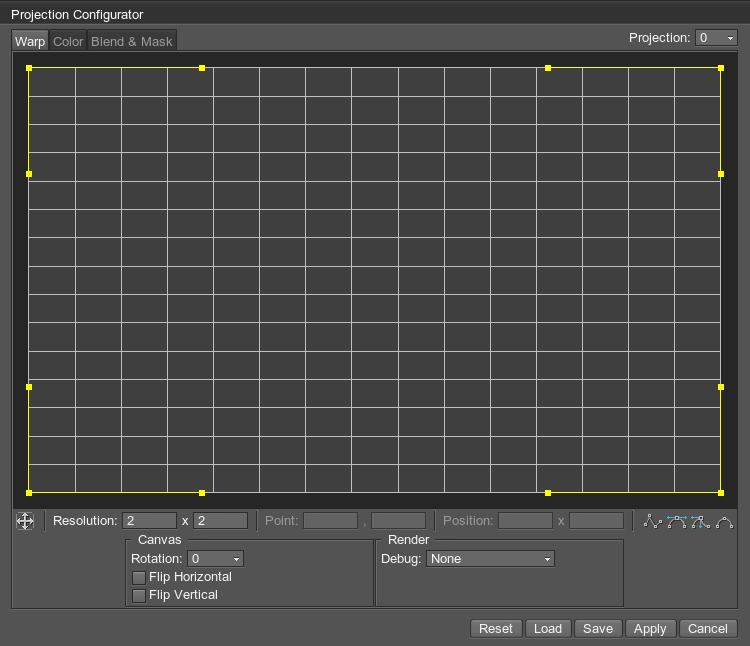 Visual editor enables you to set up warping for the selected projection using control points and yellow handles. These handles are displayed for each selected control point depending on its type. The maximum grid size is 32 x 32. Drag control points and their yellow handles to warp the projection and adjust it for the required configuration. You can see an example of warped grid and a corresponding projection image below. Point - horizontal and vertical indices of the selected control point. Position - coordinates of the selected control point along X and Y axes. Here you can configure the canvas for the selected projection: set rotation angle and enable vertical and horizontal flipping. The Debug option allows you to temporarily set individual colors for different projections. This helps to visualize overlapping regions for different projections and facilitates the setup process. The Color tab allows you to correct color intensity, as well as to adjust color balance for the selected projection. Positive values (up to 1) are added to the color values on the screen. Negative values (starting from -1) are subtracted from color values on the screen. The Blend & Mask tab allows you to configure blending along the edges and according to masks, you can also use masks to cut out certain areas for the selected projection. 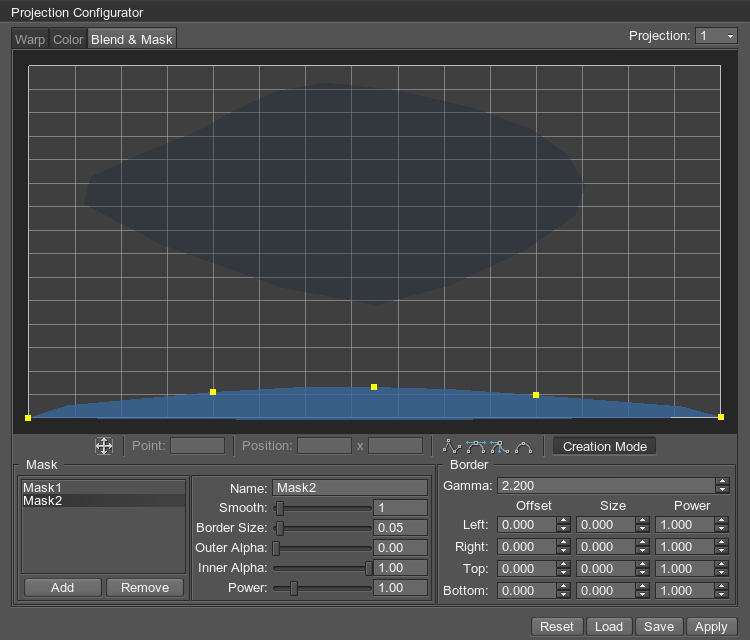 This group allows you to set up masks to be used for blending regions or to cut out certain areas (e.g. 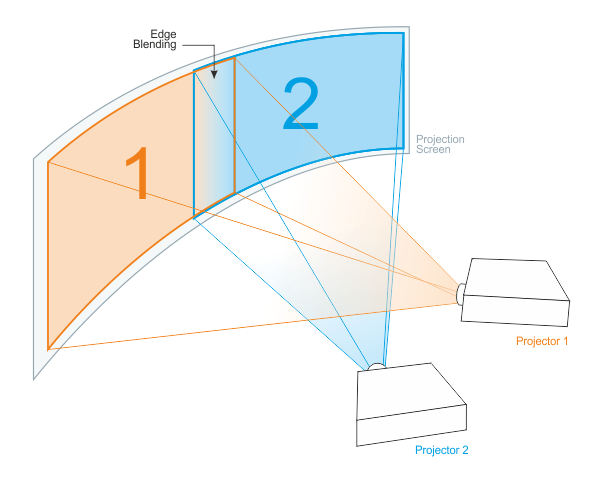 top and bottom areas for a curved screen projection). The list of masks for the current projection is displayed on the left. You can add new masks and remove existing ones using the corresponding buttons. Visual editor enables you to create and modify masks. To add new points to the mask selected in the list, you should click Creation Mode button. Then you can add new points by clicking within the grid area, new points will be placed at the mouse cursor. To insert a new point into an existing mask, select the point next to which a new point is to be added, and click to insert a new one. You can drag an existing point to move it. To remove a point, simply right-click it. You can also adjust your masks precisely by specifying the coordinates of each point. Select a point on the grid (its color will turn to white) and enter the coordinates in the corresponding Position fields below. Smooth - smoothing of mask edges. Determines the number of additional points to be inserted between the control points. 0 - there is no blending. 1 - a half of the screen is blended. 0 - the mask is fully transparent. 1 - the mask is fully opaque. Power controls how fast the screen is blended across the area specified by Size (analogous to Power parameter for the border). The higher the value, the larger the black area is. Controls soft edge blending for each side of the projection (left, right, top or bottom one). Set a non-zero Power value to start setting it up. Gamma - gamma correction value. Offset - viewport clipping offset. The clipped part is rendered in black. 0 - the whole viewport is shown. 1 - a half of the viewport is cut out. Power controls how fast the screen is blended across the area specified by Size. If more than two projections are created with AppProjection, the following viewing settings can be tweaked in the System menu -> Plugins. The field of view for all projections. (Camera tab -> Field of view option is not applicable in this case). Allows to adjust the viewing angle between projections. That is, when surfaces to project the images onto are turned at some angle to each other, this angle can be entered as Angle value and the projection will be automatically recalculated to show the right image. 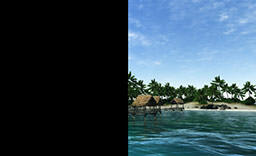 Compensates for horizontal bezel of monitors. Positive values decrease the viewport space; negative ones increase it (for overlapping). A *.proj file that you save will only contain settings for the currently selected projection. AppProjection can be customized to support custom viewing frustums (symmetric or asymmetric ones) for each projection. AppProjection has one primary viewport, while all others are rendered as auxiliary ones. By default, the primary display is the Unigine engine viewport used for one-monitor configuration. 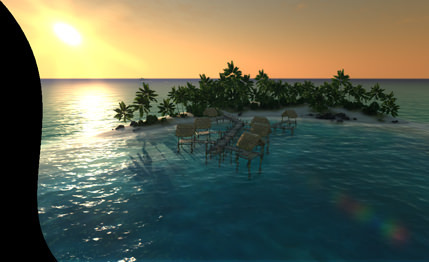 It uses matrices of the Player used by the engine to view the scene. Other displays are arbitrary cameras with any perspective and facing whatever direction needed. Each display has its own model-view and projection matrices. Both the primary projection and auxiliary ones can be enabled or disabled, if necessary. The primary viewport can be set to any projection (for supported configurations it is already set). Each viewport has its own model-view and projection matrices. By default, only a primary one has a graphical user interface (render system GUI, editor widgets, wireframe, or the profiler). However, separate GUIs can be drawn on all projections. 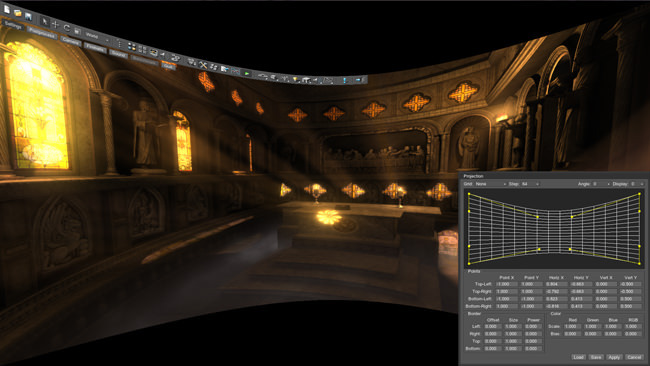 All viewports have their own viewport and reflection mask to selectively render nodes and reflections from them. For 2 projections, the 1st viewport. For 3 projections, the 2nd viewport. For 4 projections, the 2nd viewport. For 5 projections, the 3rd viewport. The default engine renderer (the same as when a usual one-monitor application is rendered). The AppProjection renderer itself (which is safer if you are going to use asymmetric frustum for the center projection and modify its model-view matrix). Only one of two renderers should be enabled at the same time. 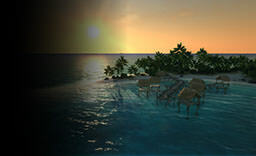 The following example demonstrates how to tweak cameras configuration and choose the renderer for the main projection. The first variant is to render the main (primary) projection by the default engine renderer. Enable all non-primary projections via engine.projection.setEnabled(). 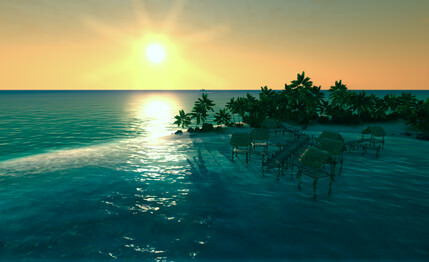 The main one should be left disabled, as it is drawn by the default engine renderer. Set projection and model-view matrices for an auxiliary projection via engine.projection.setProjection() and engine.projection.setModelview(). Another variant is to render the main projection by the AppProjection renderer. This variant can be used, for example, if you want to set up symmetric frustums for all projections. Set the projection to be used as a primary one and enable its rendering by AppProjection. Set model-view and projection matrices for all projections.